And, apart from anything else, I thought the down and upvotes from high rep users were kept. But we have a system in place to prevent the most disruptive forms of vote deletion, and we've been using it for a while now without major issues. For the foreseeable future, this is as completed as it is gonna get. The exact values of those thresholds don't particularly matter; they're pretty low, but not so low that you could hit them easily while still hiding fraudulent activity. - If either threshold is exceeded, deletion is held up until someone reviews it. Otherwise, deletion proceeds and any votes are discarded. - If, during review, it becomes apparent that the user is or ever was involved in voting fraud, [emphasis mine] the votes are discarded as they would normally be. - Otherwise, the votes are preserved. The end result of this is that most users will still see votes being removed along with user deletions from time to time... But rarely if ever will these votes cause a non-trivial drop in reputation or a sudden, wide-spread skew in post scores, which were the primary complaints in the past. So... is that it? The user who deleted their accounts was involved in some voting fraud? It seems evident that the user had two accounts, so did the user upvote their own questions and answers? For hypothesis' sake, let's say they did, my next question is. Why should any innocent user be penalized? No user should be penalized when the account of a very high-reputation user has been self-deleted. The votes were cast when the account was valid, and any voting fraud behavior the user may have indulged in subsequently should not affect the rep of ELUers. The only scenario that may justify the annihilation of thousands of votes –because it's thousands– were if the number of votes was cast by the same voter using multiple accounts. If that were the case (but I seriously doubt this happened) TPTB should discard the votes from the multiple accounts, and restore the votes from the principal account. P.S I am perfectly aware who the user is, a user who made a massive, massive contribution to EL&U, and whose main desire was to help newcomers, and deepen his knowledge of the English language. I won't engage in squabbles, the user still has my respect, this question is focused on the significant drop in reputation. Black Saturday on ELU: when the reputation stock market experienced a seismic shock, and every user felt the impact! I shall never forget the member who contributed nearly 3500 answers here, almost 750 more than any other member. And I just do not understand the reason to delete the points from votes cast by someone, when their account is deleted. Because high-reputation users have usually cast a great many votes, removing all of them could be that much more disruptive to other users. In such cases, the staff use a special deletion that preserves the votes, resulting in no reputation change for those who had been voted on by that user. Please note that the actual reputation score of the deleted user does not affect how many reputation points are lost by other users. It's theoretically possible for someone to be a member at ELU for over 4 years, being a very active reader and voter rather than posting too many answers; earning just about 5000 rep but casting nearly their full quota of votes; and when they left the site this same effect could occur, with some outstanding contributors losing 1000+ rep. Since a member does not share out upvote points (but only bounties which ironically are not affected) from their own reputation score, and has no rep gain from upvoting either, thus having no vested interest in voting on other users' posts -- and especially since upvotes and downvotes are anonymous by design -- it is perplexing why so many other members should lose their well-deserved reputation points based on deletion of one long-standing account. This was our screw-up, and preventing large impact deletes like this will be an addition to the code on our side sometime this week. For now I've gone through the database and manually undone the delete action on this user's votes, which is the net impact that should have happened if they were moved to the community user...our normal process. 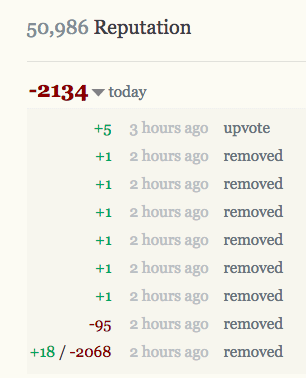 Your rep history (and about 1,300 other users) will no longer reflect this user's deletion. Unless there were some very pressing reasons for not doing it this way in this particular case (as in, sending a very strong message to all members about something of great and crucial importance) I think Stack Exchange as a network should reconsider the official policy and procedure for future such cases. I had drafted a question on this subject while Mari-Lou A posted this one. Just to add my thoughts and a relevant link, I've included my post as an answer here. I've often seen it written that reputation points on SE are "imaginary" or "meaningless," and I agree to a large extent that complaining about rep changes seems petty. Please forgive this violation of that principle. I'm also well aware that sometimes users are removed and their votes deleted, and I've taken the cut in that past when this has happened. I assume that if I lost 283 rep, then plenty of other EL&U users must have taken a hit. In short, it seems like a lot of votes were deleted. Do we know anything specific about the thresholds at which a user's votes are preserved even when they are removed? Questions on SE Meta like this suggest that when the changes are drastic, deleting the votes is avoided, but I haven't seen a figure or any numbers describing what the threshold is. (Again, with more information I don't think there's any question that this user's votes would exceed the threshold). Is there any way to learn more about these types of situations when they arise? Maybe I'll edit out this last part of my answer if it's off-topic from the question, but I want to say that I'm extremely disappointed to see this user leave, and if there's any way for them to come back, I would encourage SE to take unique measures to assist them in restoring their account. If they don't want to come back, I wish them well and express lots of thanks for what they've given my experience on the site. Here is a long answer to the question posed by the OP. Every once in a while, there's a big to-do on an SE site that gets a lot of attention, and people invested in the site want to know what happened. I usually just assume there was a lot of drama behind the scenes that only the mods and the involved party know about. This sometimes leads to meta posts and (not in this case, but I've seen it) accusations aimed at (on another site) "the evil mod cabal". There are calls for moderation transparency. Etc. I know a little (or pretty much) about how invested the mods on the site are in how they respect the privacy of the users. I was suspended once when I was miffed (I don't remember now why) and I decided to remove my negative and zero voted answers. I received a polite request not to do it, which I ignored. Additionally, after reaching the 5-a-day limit on deletions, I edited a few to mark them for deletion later (I believe I edited the others as well.) Ha. I was too green even to know that editing them put them on the front page. So I was suspended for 7 days for this nonsense, and though I was outraged, I did, in fact, cool down. None of this became public knowledge (well, it was obvious from my edits) until I explained it in chat. See, I'm free to say what I want about it, but the mods sign a contract that they will keep absolutely quiet on users' actions. Unless I release the mods from their obligation, they can't discuss it. Even if I release the mods, they probably won't be likely to discuss it. Who wants a public airing out of dirty laundry? But I can assure you of this: a lot goes on behind the scenes that keeps a site running. A lot of mod messages, a lot of discussion, a lot of escalation to Community Managers, and sometimes deletion of users' accounts when all else has failed. The OP's post is presumably about why rep was lost from a high rep user's deletion when SE normally doesn't punish the innocent. Then an edit acknowledges that there was a history of voting irregularities on that user's part. The only scenario that may justify the annihilation of thousands of votes –because it's thousands– were if the number of votes was cast by the same voter using multiple accounts. If that were the case (but I seriously doubt this happened) TPTB should discard the votes from the multiple accounts, and restore the votes from the principal account. If I remember correctly - and I don't know why, it was a long time ago, - I (and anyone else paying attention) had all the evidence I needed to figure out that the user had multiple sock puppets. I was paying attention to the site back then. The user would post truly terrible answers (later deleted when I would DV and comment) and before I could write out "instantly", two upvotes would appear. On a totally crap answer. But this is a busy site, so. I should not speculate, though, because I don't know what happened. The point is, neither does the OP. OP, you can not possibly know how many socks this user had. If that were the case (but I seriously doubt this happened) TPTB should discard the votes from the multiple accounts, and restore the votes from the principal account. First, your doubt does not a truth make. Second, who in their right mind would wish for some poor soul to go through years of a user's activity and do all that work? (I'm very tech illiterate, so maybe it's not so much work.) But that brings me back to doubts not equaling truth. We have gotten a moderator's response about this (what happened and why?) and the answer is No. It's not up for discussion. I think at the very least an on-the-record "no comment" is not too much to ask. There is not only a comment but a 'No. Not going to happen.' comment. I doubt it will vanish.